As the world closed out the 1920s and began the 1930s, a severe financial turmoil was the new reality. For many automakers, these next few years would be their last. Naturally, sales slowed considerably for Packard and other marques by 1930; Packard attempted to stimulate sales by dropping the price on all models by $400. Sadly, this move did little more to attract new buyers. With some of the greatest stylists in the industry, as well as better-than-average financial stability going into the Depression, Packard was able to survive this difficult era and even managed to create what are arguably some of their finest and most memorable creations. As the Depression began to wane, Packard began offering their first sub-$1,000 car. Beginning production in 1935, the Packard 120 saw exceptional sales figures with more than triple the total Packard amount of 1934, and doubling again in 1936. 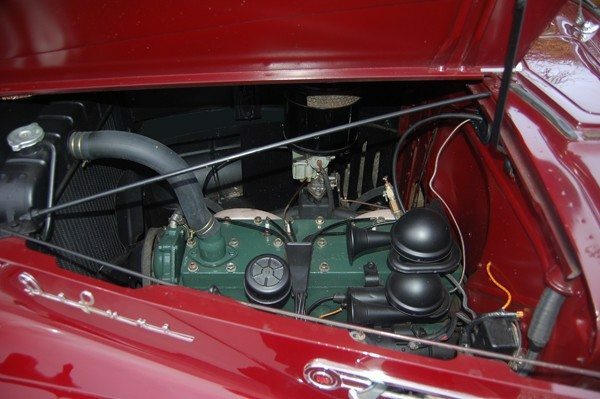 Also for 1936, Packard increased the displacement of the 120’s engine; as a result horsepower rose to 120, giving the One-Twenty a top speed of 85 mph. Packard introduced the Six in 1937. This was the first time in ten years that a six-cylinder engine could be found in a car from the Detroit luxury brand. The reasoning behind this move was again one of economics and the constant struggle to stay in business by offering a quality product at a reasonable price. Yet the Packard Six, Packard’s first six-cylinder engine in ten years, accounted for over half of Packard’s total production, finding its way into 65,400 examples. Production and profits continued to climb, jobs were saved, and the company was moving away from the extinction to which many of their competitors had succumbed. Renamed the Packard 110 for 1940 and 1941, the less expensive gave the company some much needed financial stability. The first year of the revised car’s introduction yielded sales of an impressive 62,300 units; following on this success Packard introduced a more expanded line for 1941, which included a second trim level called the Deluxe. 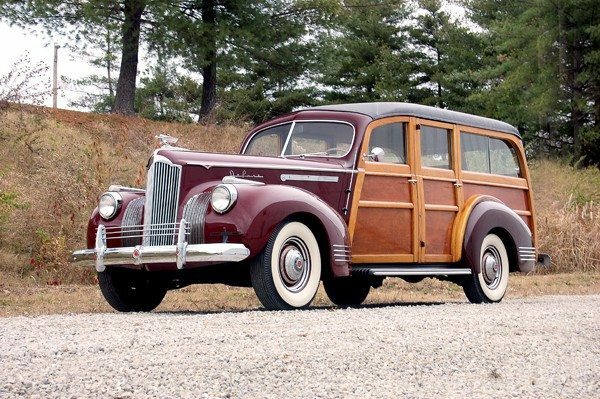 The 1941 Packard 110 Deluxe shown here is one of just 358 wood-bodied Hercules eight-passenger Packard estate wagons ever produced. 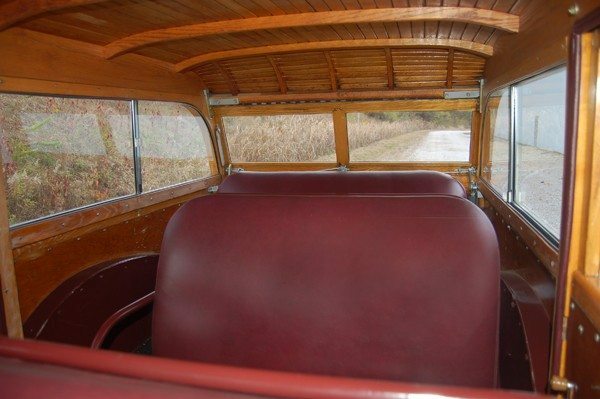 Hercules of Evansville, Indiana, is known for the highest quality coach built units, and this example still wears the original restored wooden body panels. Sold new in Monterey, California, by Stahl Motor Company, it has been restored in maroon over matching leather upholstery and carpet that contrasts nicely against the black vinyl roof and two-tone wood finishes inside and out. Deluxe trim, including the chrome fender accents and front fender marker light housings, are joined by other features including the accessory radiator grille guard, Deluxe hub caps and trim rings, wide white wall tires, optional radio, and hood ornament. 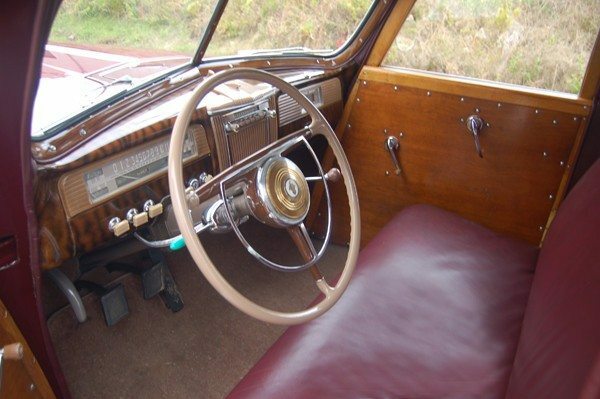 The car also sports rare running boards that were a no-cost option during this final full year of prewar production. All business up front, and pure country club out back, this is the type of vintage automobile that must be observed personally to truly appreciate both the craftsmanship as well as the quality preservation. 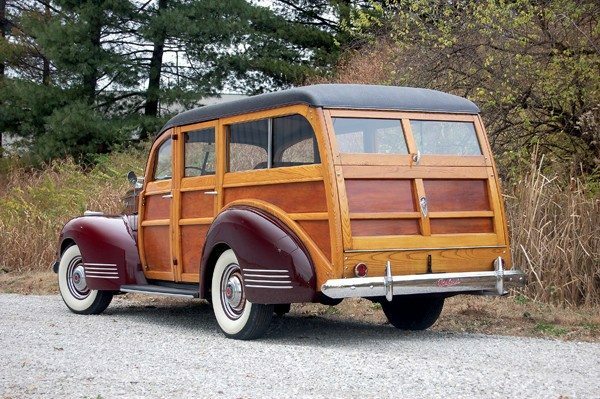 Ready to show or just enjoy on the open road today, this rare Packard “woody” wagon is a stunning representative of Packard’s ability to weather the worst economic times with style and poise and extensive quality. You care about your Packard. Let us do the same. We want to protect your passion! Click below for an online quote, or give us a call at 800.678.5173.